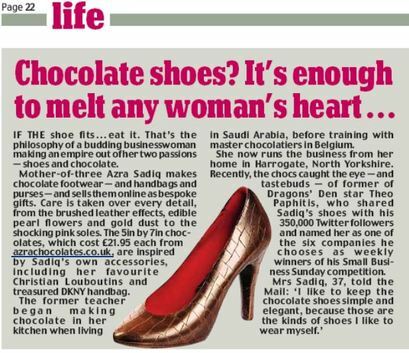 The Irish Times- Saturday 17th Oct.
Azra combines women’s love of chocolate and shoes by handcrafting, elegant high heel chocolate shoes. Whether you’re looking for that unique gift for Christmas, Valentine’s Day gift, anniversary, or wedding gift, or just because you want to show someone just how much you love them, these luxury handmade chocolate shoes and handbags make the perfect chocolate gift for a lady who deserves a luxury treat. Our luxury handmade chocolates are individually handmade in Yorkshire. We use the best ingredients and the finest couverture chocolate to create our range of luxurious chocolate gifts and wedding favours especially for you.